Designed with absolute low building costs and highly economical running costs in mind. After more than 20 years of involvement in powercat design, including offshore voyaging in poercats from 12m to 18m, I have narrowed down as many good attributes as possible to a simple, yet hightly efficient craft. 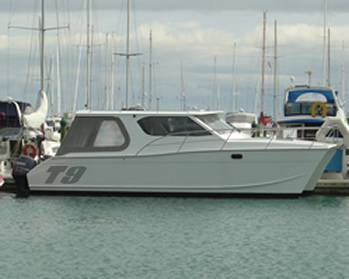 Building is to absolute basics, with one double berth cabin, and a toilet and basin in forward downstairs cabins. At bridgedeck level there is a central, forward steering station and helmseat. A hatch overhead is arranged so that the skipper can sit on the uper back of his helmseat and have his head out of the cabintop to allow full 360 degree visability. There is stowage areas aft of the stairwells in each hull up to bridge deck height, and also stowage in alcove along each side of the cabin/cockpit area. The rest of the uper deck area is complete open plan, leaving it to the owner's imagination and ingenuity, and my choice is to use low cost, light weight camping gear to complete the package to the individual's own required level of comfort. Recommended power is by four stroke outboards, minimum 2 x 100hp max 2 x 150hp. Constuction is composite epoxy, wood, plywood, foam, fibreglass and the whoe system is designed to be totally unsinkable, even in the event of very serious damage at sea, as the floatability of the construction material is greater than total dead weight of the motors, engineering etc.